October 10, 2012 - American pilots Joseph Lepore and Jan Paladino to be retried in court for their role in the deaths of 154 people that were killed in a midair collision over Amazon jungle between a Boeing 737-800 and the Embraer Legacy 600 business jet they were piloting. At the time, this accident was Brazil’s deadliest aviation accident in that country's aviation history. On September 29, 2006, a Gol Airlines Flight 1907 departed Eduardo Gomes International Airport, Manaus, Brazil at 3:35 pm local time for Presidente Juscelino Kubitschek Airport, Brasilia, Brazil with 154 passengers and crew aboard a Boeing 737-8EH (PR-GTD). The aircraft climbed to its assigned cruising altitude of 37,000 Ft.
Pilots Lepore and Paladino were to pick up a newly built Embraer Legacy 600 jet, N600XL from Embraer factory which is located at Sao Jose dos Campos-Professor Urbano Ernesto Stumpf Airport (SBSJ), Sao Jose dos Campos, Brazil. They were to fly the aircraft along with 5 passengers to New York and present the aircraft to its new owners Excelaire of Long Island, New York. Embraer Legacy was to fly Manaus, Brazil refuel and then onto the United States. Lepore and Paladino filed and received their instrument flight plan. Their flight plan was filed “as is” and they were to fly an attitude of 37,000 ft and then a decent to 36,000 ft (Hemispheric altitude rule). The cruise altitude was filed as FL370, with a planned change to FL360 at BRS, and to FL380 at the TERES navigational fix, approximately 282 miles north of BRS. At about 2:51 pm the Embraer Legacy 600 jet departed SBSJ with seven onboard. Enroute to Manaus the pilots of Embraer lost communications with air traffic control (ATC). They made numerous attempts to contact ATC but had no luck. Unbeknown to the pilots of the Embraer Legacy 600 and the Boeing 737-800 jets they were on a collision course at 37,000. At about 5 PM both aircraft collided. The Embraer Legacy lost part of its left wing and damage to its tail and the Boeing 737-800 broke-up in flight. 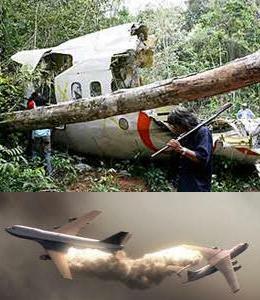 Flight 1907 crashed in the dense rainforest in the Amazon jungle killing all 154 onboard. Despite sustaining serious damage to its left wing and tail, the Embraer was able to the safely land at Cachimbo Air Base, approximately 100 miles northwest of the collision site with its seven occupants uninjured. An investigation was conducted by the Brazilian Aeronautical Accident Prevention and Investigation Center (DIPAA), the Brazilian Air Force's Aeronautical Accidents Investigation and Prevention Center (CENIPA), the NTSB, FAA, Boeing and Honeywell (avionics). A final report was issued On December 10, 2008. CENIPA concluded that the accident was caused by errors committed both by air traffic controllers and the pilots onboard the Embraer Legacy 600, faulty equipment onboard the Embraer and NTSB determined that all pilots acted properly and were placed on a collision course by a variety of "individual and institutional" air traffic control errors. The Brazilian government charged Lepore and Paladino with negligence and endangering air traffic safety for allegedly flying at the wrong altitude and failing to turn on the aircraft's anti-collision system. They were sentenced in 2011, to 52 months in prison. However, the U.S. commuted their sentence to community service. The Brazilian government will retry the case in absentia on October 15, 2012 in which they will ask for 69 months without the possibility of being placed on community service. Brazilian prosecutor, Osnir Belice said, “The sentence should be increased because despite being professionals the defendants kept the aircraft's anti-collision system turned off for almost one hour, thus causing the accident". Both pilots onboard the Embraer have insisted that their anti-collision system and transponder were never turned off and they deny wrongdoing.